Looking for something with lots of flavour and very little work? 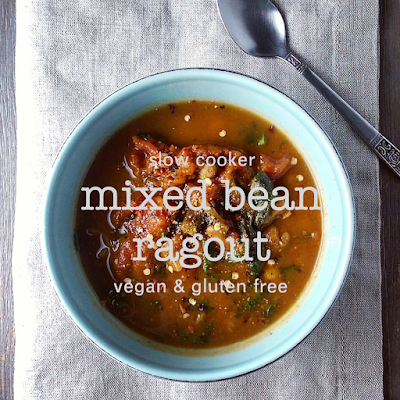 Dust off your CrockPot and make this vegan mixed bean ragout - the perfect dish to warm your soul on chilly winter nights. Set it and forget it, then come home to something magical. Use canned pumpkin purée, canned beans & canned tomatoes to make your prep work ultra-fast! In slow cooker, mix all ingredients and seasonings together except spinach and cilantro. Cover and cook on low for 5 to 7 hours. Uncover, taste for seasoning and add more salt and/or hot sauce if necessary. Add spinach & cilantro. Cover and continue cooking on high power for 1 more hour. Serve warm. Leftovers? Keep it in the fridge up to 5 days, or freeze for up to three months.